One of the most iconic and hallowed car manufacturers throughout the annals of history hails from Italy. 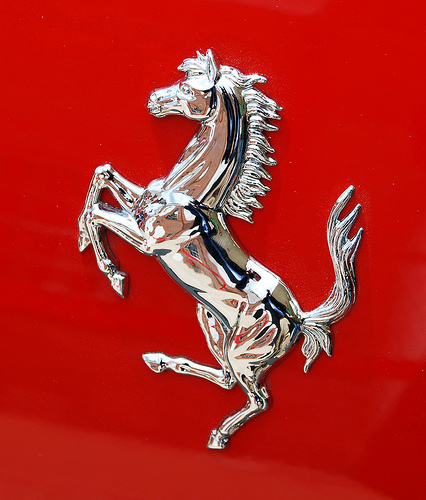 The ‘Prancing Horse’ logo that emblazons the badge on the front of any of the prestigious cars acts as a seal of approval and a mark of sheer engineering quality. This company’s cars have been successful and ever yearned for since the company’s conception back in 1947 and each year they continue to blow customers and experts away with their fantastic pedigree and acumen. The company of which we are referring to is, of course the Italian car giant Ferrari limo hire. There you go, as soon as you read that brand name the images and thoughts of excellence came rushing into your mind didn’t they? Well how about if we told you that we had in our most humble possession a stretched 360 Modena Ferrari limousine hire vehicle? That’s right ladies and gents, we said “stretched”. We can imagine that you must be frothing at the mouth in anticipation and temptation at the minute so we won’t delay on elaborate on the very good news that we have just made you aware of. The 360 stretched Ferrari limo hire comes in either the trademark red that has become synonymous with Ferrari limo hire or the sleek and seductive colour of black. This vehicle is able to transport up to 8 passengers in the most comfortable of styles. This limousine also comes back with the mod cons you have come to expect from riding a limousine. As well as having a central large screen TV on board broadcasting your favourite movies and DVDs that you have brought with you, there are also mini LCD TV built into the headrests so you wont miss any of the action if you are positioned in an awkward place or angle. Compounded with the fantastic disco and other audio features included in our Ferrari limo hire you can’t help but be seemingly transported into another world full of luxury, bliss and ecstasy. Yes, these vehicles are just that good. Imagine surprising a groom or bride to be on their respective hen or stag nights with one of the gorgeous cars as their carriage of the evening. You might need to pick them up after they have fainted and carry then into the limousine and then revive them with a glass of champagne that we have generously supplied to your party as a way of saying ‘thank you’ for choosing our cheap limo hire company and hoping that you enjoy the fantastic service that our car and our thoroughly experienced and highly trained chauffeurs limo hire bestow upon you. For any event you may be planning booking the fantastic Ferrari limo hire should be a no brainer especially at our low cost prizes that may get even lower when you book it in a package. The cost of course is no match for that unbelievable feeling as people all around stop what they’re doing and watch you and your friends or family cruise past them at the height of excellence.